The United States must rethink its relationship with Latin America if it wants to respond to China’s influence. In the global competition between world powers, the battle in Latin America exemplifies how power is shifting toward Asia. China has been steadily strengthening political and economic ties with Latin America, while the United States has missed numerous opportunities to strengthen ties with its southern neighbors. From President Barack Obama’s pivot to Asia, to President Donald Trump’s “America First” stance and hard-edge approach to immigration, many in an increasingly confident and economically attractive Latin America believe the United States has taken them for granted. By contrast, Chinese companies have invested over $100 billion in Latin America in a wide range of industries, from oil and metals extraction to information technology, electricity, and infrastructure. And they have set a goal for investment capital to reach $250 billion by 2025. Moreover, China is now the number one or number two trading partner of Brazil, Argentina, Chile, Mexico, and Peru. China’s foreign minister, Wang Yi, also recently invited Latin America to join China’s Belt and Road Initiative, with promises of large loans to cover major infrastructure projects. Increasingly, Latin America countries are aligning themselves rhetorically with China. 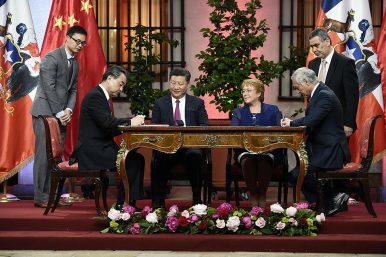 Chilean Foreign Minister Heraldo Munoz recently praised China for its “constructive role” in the region, and for rejecting protectionism. This was a veiled reference to Trump’s “America First” policy. In reality, China remains more protectionist than the United States, although you wouldn’t know it from listening to each country’s leaders. While President Xi Jinping of China hails free trade, the country practices neomercantilism, a trade strategy based on import substitution and industrial exports, exemplified by its Made in China 2025 policy, which aims to dominate high tech industries and significantly increase domestic market share of components for electronics. U.S. officials are now speaking their minds about China’s growing economic links with Latin America. U.S. Secretary of State Rex Tillerson noted in his speech at the University of Texas on February 1, “China… offers the appearance of an attractive path to development… but, this often involves trading short-term gains for long-term dependency.” This is not always true, but has been the case for certain countries. For example, Ecuador currently must ship more than 90 percent of its oil to Asia, as it owes more than 500 million barrels of crude oil to China, depriving the country of an important source of revenue. Another U.S. official, Treasury Under Secretary for International Affairs David Malpass, also partially blamed China for Venezuela’s woes. “Most of the blame for Venezuela’s economic collapse and humanitarian disaster falls squarely on Venezuela’s rulers, but China has been by far Venezuela’s largest lender, supporting poor governance,” Malpass said. “The result will raise the ultimate cost to the international community once Venezuela returns to democracy and economic reforms.” China was a steadfast lender to Venezuela in deals that have topped $60 billion, giving a lifeline to a sinking ship. Malpass also sent a letter to the president of the Inter-America Development Bank (IDB), calling out the IDB for having its annual meeting in Beijing next year rather than in Latin America. The United States is the biggest shareholder at the IDB and China’s stake is less than 0.01 percent. This shift in rhetoric from the current U.S. administration is rooted in an insecurity that the United States may have opened a door that it will now be unable to close. Trump’s more aggressive policies on immigration and his upsetting of the U.S. rapprochement with Cuba have set the United States back in the region. A recent Gallup poll shows approval of the U.S. president in Latin America has fallen to just 16 percent. But those that blame only Trump fail to see that shifts in global power are longer term structural trends that are larger than any one U.S. president. China’s economic power has been increasing for decades, and its military has been growing steadily since the 1990s. Conversely, the United States has seen relatively low economic growth since the global financial crisis and has cut defense budgets. The United States should focus more attention on the battles for soft power and influence around the globe. In Latin America, the United States should start by focusing on strengthening relations with its direct southern neighbor. The Mexico of today is a dynamic hub of innovation and economic diversity that is taking on difficult reform issues. And recent conflict in the U.S.-Mexico relationship, like threatening to build a wall along their shared border or pulling the United States out of the North American Free Trade Agreement (NAFTA), have pushed Mexico to cozy up with China. Mexico has recently seen a rash of investment from China, from e-commerce to auto manufacturing, and Mexico has openly spoken about increasing trade with China. Similarly, the United States must focus on strengthening relations with its allies Brazil and Argentina. China has recently surpassed the United States as Brazil’s largest trading partner, and now Brazil is the largest Latin American supplier of oil and soybeans to China. Rather than focusing on trade in commodities, U.S. imports from Brazil focus more on manufactured goods and services, good for the long-term development of the country. Former commander of the U.S. Southern Command James Stavridis recently cautioned that the United States must approach the region with more humility. Latin America is not “America’s backyard,” but rather an attractive economic partner and important security ally. Tillerson would have done well to exclude from his speech declarations that the Monroe Doctrine, a document that painted Latin America as a U.S. sphere of influence not to be touched by outside powers, is “as relevant today as it was the day it was written” in 1823. It’s time for the United States to construct a new, modern relationship with its regional neighbors. This will be a more fruitful strategy to respond to China’s growing influence south of the U.S. border. Sean Miner is an associate director and fellow, China – Latin America Initiative, at the Adrienne Arsht Latin America Center of the Atlantic Council.